150 € – possibily of taking in sterling GBP & US dollars via Paypal. 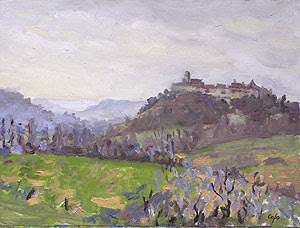 Monflanquin est une village perchée du Lot & Garonne = Monflanquin is a villege ‘perched’ on top of a hill in the Lot & Garonne department (county). It used to have alot more defensive towers & walls but Richelieu knocked them down in his campaign to subjugate the south west of France. 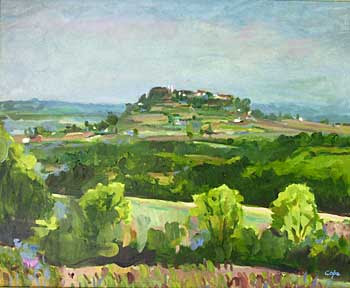 Here’s another oil of Monflanquin. 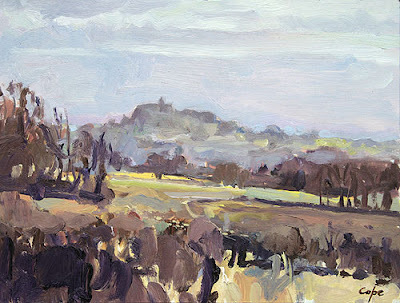 And here is an 30 x 40 cm alla prima blog etude from last Feburary, of the next fortified hill top town Tournon d’Agenais. Adam – I’m tinkering with a blogroll of french bloggers. Let me know if you’d like to be included. Good work on the winter scenes, without getting the colours muddy. The light on the trees on “sous la pluie” is damn fine too.